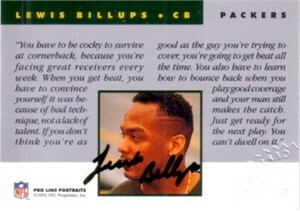 1992 Pro Line Portraits certified autograph card of former Green Bay Packers cornerback Lewis Billups, who died in a 1994 car accident. The corner is embossed with the NFL shield logo confirming authenticity. With certificate of authenticity from AutographsForSale.com.